Today my newest book has been released from Five Rivers Publishing. 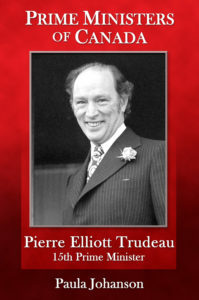 It is a biography of Canada's fifteenth prime minister, Pierre Elliott Trudeau. There's always something new to bring to a study of the life of such an active person. I'm particularly proud of pulling together so many moments in his life as an enthusiastic canoeist! This book is my third from this expanding press based in Ontario, and either my thirty-first or thirty-third overall .. time to check and update my C.V.